The MSV-5000 incorporates a double-beam scanning spectrophotometer for optimum measurements in the UV-Vis to NIR region (200-2700 nm). 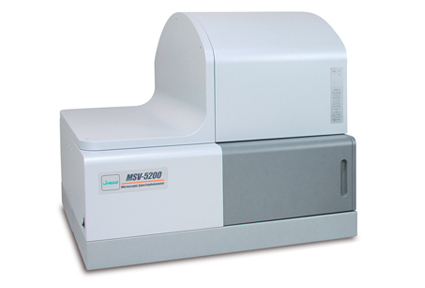 A broad range of applications including the collection of transmittance/reflectance spectra of a sample, measurement of the band gap and film thickness of semiconductors, evaluation of the optical characteristics of functional crystals and the color analysis of microscopic samples can be easily implemented using the MSV-5000 series. The MSV-5100 is a dedicated UV-Vis microscope with a wavelength range of (200-900 nm). The MSV-5200 includes a Peltier-cooled PbS detector and has a wavelength range of (200-2700 nm). The MSV-5300 incorporates an InGaAs detector to obtain optimized NIR measurements and has a wavelength range of (200-1700 nm). The wide-band cassegrain objectives provide continuous transmittance/reflectance measurements for the entire spectral range desired, without the use of expensive, coated refractive objectives. An optional automated XYZ stage also offers mapping/imaging capability for larger samples. A PC-controlled objective carousel can be used to select any of the available 10X, 16X or 32X objectives in combination with the standard optical zoom feature to provide enhanced video imaging of the sample utilizing a high-resolution CMOS camera. Options include binocular viewing, polarized observation and selected refractive objective lenses. The microscope system utilizes wide-band cassegrain objectives to provide transmittance/reflectance measurements continuously from 200 to 2700 nm (MSV-5200). Spectra Manager™ II software, a cross-platform control and analysis package for all JASCO spectroscopic instruments, offers quick and easy data acquisition and analysis. *1. Cassegrain objective and cassegraing collection mirror are provided with the same magnification. *2. The moving distance of the condensor mirror and the objective magni?cation depends upon the sample. *3. Optional programs are provided when auto stage is selected.